Police have confirmed a small bomb exploded on a bus in Jerusalem on Monday during the evening rush hour. Eye witnesses has said an empty bus caught fire and exploded as a second bus was nearby, injuring at least 15 people, at least two of them seriously. However Israeli police said the incident bore all the hallmarks of a militant attack, and their initial fears have been confirmed. Bus attacks were common in Israel from 2000 to 2005 when they were a target of choice for Palestinian extremists, but have been all-but eliminated after Israel tightened security and began building its concrete wall around Jerusalem. 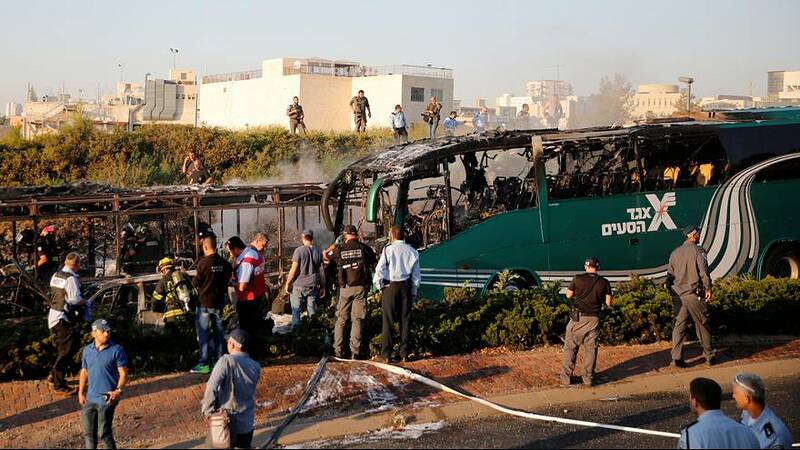 The bus was travelling to Hebron at the time of the explosion, which eye-witnesses described as large. Both vehicles caused traffic chaos as they burned in the middle of the busy road until fire crews could put them out. No-one has yet claimed responsibility.